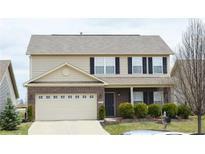 Below you can view all the homes for sale in the Brighton Knoll subdivision located in Noblesville Indiana. Listings in Brighton Knoll are updated daily from data we receive from the Indianapolis multiple listing service. To learn more about any of these homes or to receive custom notifications when a new property is listed for sale in Brighton Knoll, give us a call at 317-910-4605. Master suite features walk in closet. Open Concept living area! MLS#21635437. MC Home Realty. This Home has it all, all you have to do is Move in! MLS#21631522. RE/MAX Ability Plus. Its time to live the way you have always wanted to, stop in today. MLS#21632004. CENTURY 21 Scheetz. Backyard has nice landscaping, large paver patio w/cedar pergola & privacy fence! MLS#21631872. Skelton, Inc. Real Estate. The fridge, dishwasher, furnace are just 2 years old. Don't miss out! MLS#21630793. RE/MAX Legends Group. New roof will be installed prior to closing! MLS#21630546. Plat Collective. Island in kitchen not included in sale. Recent price drop!! ! MLS#21630195. Kirk Realty Group, LLC. Bring your buyers this one won’t last! MLS#21629366. eXp Realty, LLC. Excellent location just minutes from shopping & entertainment. This home has it all! MLS#21628758. No Hassle Homes. Community pool w/ bath, walking paths and playground. MLS#21627782. Highgarden Real Estate. Then you will love the walking path around the pond/parkway just outside your front door. Welcome home! MLS#21619326. Keller Williams Indpls Metro N.